SFH inventory in our segment continues to dwindle. For every new listing in July, 1.16 homes sold. We've been watching this segment very closely and honestly would have gone to check out a few had any of them been deemed viable options for us. The reality is they're not. Back in February, we saw about a dozen potential homes. Today, not so much. SFH are getting more expensive in this segment. We don't see anything priced above $425K. I'm almost willing to bet that if we changed our criteria to $450K we'd see many more properties. That's barely a 6% increase in price, but wow does it ever price us out quickly. Condos are doing funny things right now. We're seeing prices all over the place. Despite the 68% sales/listings ratio I'm tempted to think that condos in our segment are definitely in a bit of an inventory spike/buyers market. We're seeing one-week price reductions. You can see some signs of rush selling; which is likely a result of needing to close on the next purchase rather than any market-related panic selling. We're also seeing fewer flipped units. Quality of construction is expected to be a significant issue in the next decade, prepare for another "quality crisis"
Craig spoke to issues that are near and dear to my heart. On inflation: CPI is really good at counting what it counts. The real issue is that it doesn't count what we spend our money on, and what it does count discounts the fact that products change. Yes you are spending more than 2% on the things you buy. But don't worry because the BoC has long since departed from using the CPI as the main index it uses to set monetary policy. Local RE: buyer beware. Location, location, location. Diversify, Diversify, Diversify (if all you hold as investments is property, look out). Stock Market: if you're heavily weighted in commodities/oil & gas, it's time to re-balance your portfolio; look outside North America for long term growth. According to the Canadian Association of Accredited Mortgage Professionals mortgage fraud is a growing problem. This article on the CBC website points out some of the highlights of what could well play significantly into any repeat of the sub-prime lending woes of our southern neighbours up here in the land of endless prosperity. The mortgage industry in Canada has undergone dramatic changes over the last several years. As more lenders and mortgage products come on the market, competition for business increases, resulting in increased approval rates and reduced application processing time... [creating] more opportunities for various types of real estate fraud involving titles and mortgages. The average case of real estate fraud in Canada is now about $300,000. In 2005, real estate title fraud claims accounted for 33 per cent of the total dollars paid in claims at title insurance company, First Canadian Title, up from six per cent in 2000. Mortgage fraud is the material misstatement, misrepresentation or omission relied upon by an underwriter or lender to fund, purchase or issue a mortgage loan. Mortgage fraud occurs in a broad range of activities related to property, employment, identification, equity and title. These include such activities as inflating or deflating appraisals and valuations of property, misrepresentation of property characteristics such as forged or altered MLS (Multiple Listing Service) listings, and misrepresenting commercial property as residential or the number of units in the property. It's a crime-wave sweeping the country, and it's a problem no one wants to talk about – not the banks, not the government, not even the victims. So who's looking out for who regarding this? Seems like the banks are starting to look out for themselves: Ms. HHV informs me that more than ever, her bank is requiring appraisals on mortgages in this town. Of course, that could mean they don't have the same confidence in a continued rising market here anymore. More mortgage fraud info can be found here. After a story about the most expensive home in town, comes an article about the cheapest house in Victoria. Do you think the editors at the TC came across my little rant from two days ago? Not likely, but never-the-less, good ol' Jack Knox wrote a reasoned article about the perils of astronomical housing prices in Victoria. We say, good on ya Jack. Here it is: Two bedrooms. One bathroom. Built in 1931. Just 836 square feet. Railway tracks out back. 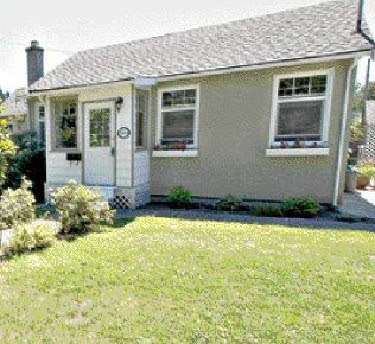 At $325,000, the Esquimalt rancher is the cheapest single-family house listed on MLS in Greater Victoria. "It's a cute house, but it's very small," says real estate agent Deanna Noyce of the property at 1255 Colville Rd. "It's perfect for a first-time buyer." Yikes! Imagine being a first-time buyer in today's climate... $325,000 to get your foot in the door? That's more like a nightmare. How, when you compare Victoria house prices to incomes, is this sustainable? People back home in Ontario thought she and her partner were nuts to pay $200,000 for it three years ago, but from a Victoria perspective it was a bargain, particularly when compared to what was then the lowest-priced house, a bug-infested $196,000 fixer-upper with no plumbing and a caved-in roof held up by sticks. In 1985, the average price of a single-family Victoria home was $93,865, or less than twice the average Victoria family income of $51,000. By 1995, the average home had risen to $242,012, or five times the average family income, which had dipped to $47,600, according to Statistics Canada. By 2005, the same house cost $463,399, more than seven times the $64,100 earned by the same family. In June of this year, that house sold for $573,415. The income stats aren't yet available, but assuming a five per cent salary increase in the past two years, the house-to-income ratio would be 81/2 to one. Thanks Jack! for making people read about the fundamentals again. Emphasis is mine. I can't think of a better way to thank Jack, apart from a letter to the editor, than a donation to his fundraising effort for Cops for Cancer Tour de Rock. Victoria Mansions: keeping the MSM honest? It never ceases to amaze me that Victoria has some fantastic properties. I rode past this one the other day on my bike. I knew it would be another on the long list of always-for-sale uber properties on our waterfront loop. 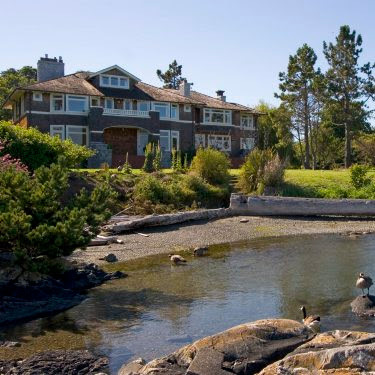 It is one of several Greater Victoria properties on the multiple listing service with price tags topping $10 million as Victoria's real estate market continues to sizzle. "There are definitely more properties listed at this price point," said real estate agent Sylvia Therrien, who is selling the estate at the corner of Rutland Road and Beach Drive. Within this group, the Rutland property, with more than 215 metres of waterfront, three islets, a private woodland, seven bedrooms and 10 bathrooms, is the "crown jewel," she said yesterday when asked to explain the $7-million jump. Am I the only one that doesn't get this logic? For $#@& sakes Sylvia, they've done nothing to the property in a year and you price it up by 60%. And an even bigger what the $&#% to the TC for not questioning this one bit. No market in Canada has grown by 60% in the past year. Victoria's hasn't even gone up 10%. Sizzling, yah right. Record sales sure. Record sale prices too. Don't forget record number of listings. Rising interest rates. A forestry industry that is all but shut down. An economy that has inflationary pressures that could lead to recession. A stock market that has lost over 700 points (4%) in four days. Keep it up pumpers, keep it up. Updater: CBC is on it today... look out. UPDATERER: That 4% loss in a week has almost doubled today; we're now talking about a loss on the week of close to 7%. And we still have a day of trading left. I genuinely hope you all aren't losing too much savings today. The U.S. subprime mortgage sector has been a source of worry in the United States for several months, as rising interest rates have led to more people falling behind on their mortgages or going into default. In addition, the failure of a group of banks to a sell a debt package for Cerberus Capital's acquisition of Chrysler prompted worries about corporate lending. Big threats are being ignored as investors celebrate the stock market's latest milestone. We haven't seen such arrogance since the heady days of 1999 and 2000.
it was logical to conclude that many of these [subprime] mortgages would be defaulted on, creating ramifications throughout the financing and economic food chain. Sales advanced in all retail sectors in May except in the furniture, home furnishings and electronics stores sector. Retailers in this sector saw sales decline 0.8 per cent, following six consecutive monthly gains. I guess we're not buying stuff for our new homes anymore then right? "Perhaps most notably, the gains are fanning out from Alberta, with almost all provinces posting impressive growth. This clearly puts additional Bank of Canada tightening in play, above and beyond a second quarter-point rate hike in September." Inflation is not, I repeat, NOT, contained to the West, as many people like to argue. Nope. Loose monetary lending policies are all pervasive and even where incomes and RE prices aren't going crazy, high ratio lending is driving consumer trends skyward. The TSX was up 13 per cent year-to-date at the start of this week. Biggest single day drop in 3 years. Inflation concerns are the cause. Down over 500 points this two-day-old week. Is it strange that this is happening in July? Usually this kind of thing happens when people are at work trading, like in October. "And anybody that cannot take this sort of thing should not be in the markets." Does the same rule apply to homeowners? Jitters over the subprime mortgage sector were compounded after Countrywide Financial Corp. — the largest U.S. mortgage lender — said its profits fell sharply as mortgage banking earnings tumbled. The company also cut its profit outlook amid rising mortgage delinquencies. "Anybody who argues with momentum, until the momentum becomes irrational, is going to get slaughtered," said A.G. Edwards market strategist Al Goldman on CNBC this week. Leave it to BubbleVision to come up with Sh$t like this. Nope, no irrationality in this market, nothing to see here, keep moving. Can anyone remember a time in recent history when both the RE markets and the Stock markets have gone completely bullish and irrational together like today? the market could be vulnerable to a "melt-up" that could shoot the indexes substantially higher in the next few weeks. And there's little to support stocks if a melt-up gives way to selling. The last big melt-ups were in 1987 and 1999, when the Dow moved from 10,000 to 11,000 in just 23 days. Early in 2000, the market tipped started [sic] a slide into the worst bear market in generations. Bulls, of course, will argue: "this time it's different." I should disclose that two mutual funds that I own, both that regularly generate 20% plus rates of return yearly, are in the midst of equity sell-offs and are aiming for 50% cash holdings during the upcoming storm they foresee happening. My thoughts on the dollar: sure our dollar seems strong, but it's measured against an increasingly weak US benchmark. Talk to someone buying Euros or Pounds and they'll tell you just how strong our dollar really is. Inflation is crazy right now. I know, I know, look at the CPI you'll say, it doesn't lie. Nope. You're right. It doesn't lie. It just doesn't count a lot of the things Canadians are spending money on right now. Especially things that are subject to irrational market forces: like food; especially fresh food. My food bill this year is almost 30% higher than last year. And it isn't because I'm getting fat. It's because food is more expensive. Our gas consumption is down. We drive less than ever. But our gas bill is roughly the same as last year because gas jumped over that psychological benchmark of $1/L and will likely not drop below it again anytime soon. Red sky at night, sailor's delight. Red sky in the morning, sailors take warning... am I the only one seeing red at economic dawn these days? Firefighters said it was only a matter of time before a fire of this magnitude broke out in the area, blaming poor construction materials and lax building codes. Damage could have been minimized, they said, if building codes required a greater distance between houses and required certain types of siding to be used. Building codes in Canada are another example of where politics trumps common sense. Does it make sense that what is reasonable to build in Ontario would withstand the environmental pressures in Victoria? Of course not. That's why we have a national building code that provinces use to base their provincial building code standards off of. But when provinces hell bent for development--of which, BC and Alberta, stand out--ignore the common sense ramifications of engineered product suitable for one climate and not another, we get debacles like the Leaky Condo Crisis. What's interesting about that crisis is that it's not a Vancouver problem, nor is it limited to condos. It was a national building code problem that became an issue for moist environments: anywhere on the west coast fits this description; from Prince Rupert all the way down to Victoria. Sure condos get the attention, after all they are a loud collective voice. But houses were built using the same code. I know of dozens of houses in this town that have had significant structural "surgery" to fix moisture related damage to their "bones." I've lived in some and seen work done to others. I live in one right now. The Edmonton Fire Service is blaming engineered wood products for a lack of ability to withstand fire. Apparently engineered joists and trusses go up a lot quicker than their solid wood counterparts. Fair enough. Perhaps not surprisingly, vinyl siding burns quicker and hotter than other products. And guess what?, when you build houses too close together, you increase the risk of one fire growing into two, or in the Edmonton case, 10. This is where economics come in. In a time of astronomical housing price increases, developers build as fast as buyers buy, and quite often not as fast as buyers buy. The cheaper the cost to build, the bigger the profit. Real wood costs money. Engineered wood products cost less money. Common sense says we'll see much more engineered products in new construction and renovations. Not to put 2 and 2 into 4 or anything, but I'm guessing with the current push to develop anything and everything into a wealth generating vehicle, from amateur condo flippers to publicly held RE development corporations, we're in for some nightmarish times in the next decade as consumers. Write your MLA. Write your MP. Sorry for my lateness with this. Don't know where my head has been the last few days. The SFH segment we watch has not had any changes to it in terms of the economics. Prices are still high; sellers are still discounting; though properties are still selling and getting close to asking prices. I would expect that if a property is discounting its asking price, then that would invite some low-ball offers. If that's happening, then one of two things is taking place: sellers aren't budging from their list price much, or agents are miss-reporting actual sales prices to keep things looking close on paper. I'm guessing that given the sales/listings ratio is still very much in a sellers favour, that it's the former and not the latter that is happening predominantly. The condo market is dubious right now. I understand that it is pretty much the only property the wage-earner can afford these days without living completely house poor. But people have to be aware of the amount of product coming online in the very near future. The stats I count are also skewed in that new developments are still not being listed on the MLS system. Would that change the sales/listings ratio? Of course, nothing being built these days fits into our price ranges anyway. Also, for every new building, there are also some sold units, so that ratio may come down a bit, but I don't think it would drop down to under 50%. That number is what I'm looking for to signal a shift to a buyer's market in condos. Big jump in sales in early July in the condo market, right around the time of interest rate hikes. What does this mean? Is there a bunch of FTB's scared of being priced out forever and not using their "discounted" pre-approved mortgages before their 90 days is up? It seems that the sales lines being used by Realtors and mortgage brokers are working. I went back and re-read our "watching" posts from when we first started this thing. Nothing has changed really: neither up nor down. Is this good? Or is it bad? I want the market to correct. I'm starting to believe less-and-less that it will be happening anytime soon. I wonder if this had anything to do with the US run-up in housing prices and subsequent crash? No wonder that Ontario-based manufacturers are crying foul at interest rate hikes. Not to be left out, I bet a similar graph would demonstrate Oil & Gas-related skilled trades positions receiving similar disproportionate pay in comparison to University Professors. No wonder why RE prices are headed upward in Alberta, Saskatchewan and NE BC. But of course, this is sustainable, non? "The truth of the matter is, a lot of baby boomers and war-time babies have not adequately prepared for retirement," said Bill Gleberzon, spokesman for CARP, Canada's Association for the 50 Plus. "Many of them, if you look at the amount they have actually stored away in their RSPs, among those who have RSPs. . .the amounts are around $60,000. That's certainly not going to get you through 30 or 40 years of your life after you retire." While they're regarded as the most affluent group in Canadian history, society can expect to see an economic "division of the baby boom," said Prof. Doug Owram. "There's going to be a group of baby boomers for whom all of this image of affluence and consumption isn't reality," said Owram, an historian with the University of British Columbia. "Society is going to have to watch that side of things, otherwise they could find real social problems down the road." That's OK though. That "disadvantaged" group will live in Saskatoon. You know, the town that is out pacing Victoria in terms of percentage population growth and RE inflation. In The Julia, two potential buyers were looking at units. The place still isn't completed, but one building has owners moved in. By my quick count of the occupied vs still available chart, one building is just over 50% sold. I'm guessing that makes the whole development close to 75% sold. And at $360K for a ground floor 960SF 2-bed 2-bath condo, I can see why. This place reminds me of Tuscany Village, only it's cheaper (if that word can be used here). The only thing cheap about the place is the quality. You're looking at almost $400K if you want to be top floor of the four story complex. I don't understand why marketers keep up the quality-hype. I'm no building expert. Heck, I can barely change a light bulb. But even I understand that the little metal ring that goes on the outside of the shower head pipe is supposed to be flush with the drywall behind it. But when you tile half-way up the pipe and don't either finish the tiling or cut out a semi circle, you end up with a plumbing problem and a clear indicator of bad finishing. Again, The Julia uses that age-old technique of metal drawers affixed to real wood fronts. Plywood isn't that expensive folks. And real wood drawers in the kitchens and bathrooms go a long way at demonstrating quality, as do solid core doors. If you bill a suite as luxury, it shouldn't look like you shopped for finishings at Home Depot. If I think I can do it myself, why wouldn't I just buy that $220K same-sized unit two blocks north in a building I know doesn't leak because it's been there for twenty years and spend $15K making it "luxury" myself? If I were to buy this place so I could tell all my friends at Bayview that I own a luxury condo too, it would be a bit like showing up to a 7-series BMW rally in a Hyundai Sonata. There's nothing wrong with driving a Hyundai (trust me :)), but you don't tell the world it's luxury when clearly it's not. The unit we checked out was ground floor. It had a patio that faced West, so you weren't going to see much sun on it. Fair enough. But for all the landscaping they did there, why the heck didn't they make the patio large enough to have a BBQ and a small patio dining set? I'll tell you why. Because they don't care about anything other than getting as much money out of you as possible and doing as little as they must to get it. The next place we checked out was a townhouse on McKenzie Avenue. It was an end unit on the street-side of the building. It was big: 3 beds, 2 baths, a living/dining combo and a nice enclosed family room. It had a nice patio and a bit of a flower garden. It also came with a price tag of almost $390K. And the nice ambiance of a four lane major thoroughfare in town. The one we missed was a house for $389K on Cedarhill close to La Colina. It's a 1300SF 2-bed 1-bath up with a 1-bed mortgage helper down. It had a really nice deck and looks like it's been taken care of. Obviously overpriced and on a busy street and at nearly a month on the market, not an in-demand place. I did see an agent sitting outside waiting for a client for what must have been at least 10 minutes. I wonder if he felt hungry? Too bad I didn't have a Snickers bar instead of our giggles. We keep meaning to go into Amara during their showtimes. But they keep changing them. It's OK though because they've had two units left for over a month now, so I don't think we need to rush in real quick. Regular readers know I'm a bit of a pundit. I try to leave politics out of economics/RE most of the time, but then I read Sh$t like this and I can't help myself. Some regular readers may know my origins don't lie in this town we collectively view as paradise within Canada. I'm actually a prairie-boy with ties to a certain City of Champions which still holds my sports allegiances (Go Oilers!). 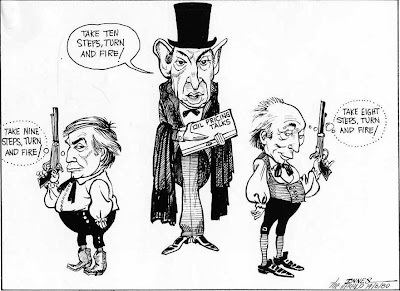 Regardless, when I read this kind of pick-on-the-West that has been long constitutionalized within our great, united [sic] nation, I can't help but think back to the great slogan that characterized the Trudeau/Lougheed battle of the early 1980s: "Let those Eastern Bastards Freeze in the Dark!" Let's highlight some of the main points of this Ottawa-centric author, shall we? But the blanket will cover all of Canada, not just Alberta. And with the higher loonie that interest-rate hikes will reinforce, the rest of Canada's economy will already be at a snail's pace. Higher interest rates are a not a good solution. Sometimes I could just scream. Look, I'm all for a housing market correction. I'm all for re-investment of government funds into universal social programs that benefit everyone--healthcare, education, environment--but I'll be cod-walloped if I'm going to sit here and read how central-Canada need not take responsibility for their excessive consumer-spending ways fueled not by increased resource-royalty revenue, but by artificially low interest rates created by past central government overspending and subsequent belt-tightening monetary policy. OK. I apologize profusely if my argument has become too political and left you scratching your heads thinking "what the F#$& has this to do with RE in Victoria?" Simply put it goes something like this: our markets are interconnected. That old adage of "location, location, location" is just marketing. Monetary policy--the amounts governments spend, save and borrow--has everything to do with your home's actual value. Loose monetary policy (really low interest rates) has the effect of artificially raising values. Hence today. Some call that inflation. What's a government to do. Nothing. It's why we have an arms-length central bank. They get to wear the repercussions of belt-tightening (interest rate hikes). Bummer about those rate changes, eh? Still wondering why it happened? OK, all kidding aside, we're glad that the BoC didn't cave to copious political pressure to leave rates as is. No recession is on the horizon currently, in fact, quite contrarily, this rate hike looks to be one of likely four to happen over the next 6 months. I'll go out on a limb and state unequivocally right here and now that I expect the BoC to increase the rate by 0.25% at every opportunity they get this year (which is 3 more after today). Look for a prime rate of 5.25% by year's end. So what does this mean to all the house hunters out there? Ms. HHV, one of the most cautious financial managers I know, is all over variable rate mortgages these days. She loves 'em. Why you ask? Well simply put, they save you money. And a lot of it. But as all things that save you money come with, a note of caution: you gotta fit the economic fundamentals to take advantage of this. 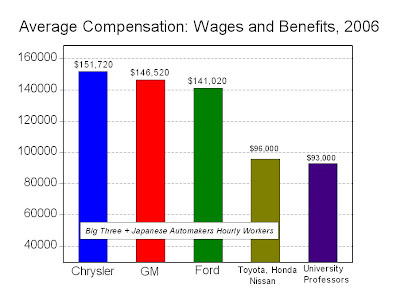 I'm going to extensively quote an economist rather than give you a knee-jerk explanation here. See where you fit into his advice. The risk-averse worrywart who is constantly looking at interest rates and wondering if ‘now’ is the time, should do what all risk-averse investors do: diversify. Indeed, there is a strong argument to be made for diversifying your mortgage debt, similar to the prudent strategy with your investment portfolio. Now, in general, diversifying your debts is a silly idea since you should put all your eggs in the one basket with the lowest interest rate. But, I do agree that split rate mortgages make some sense in today’s ultra-low environment. The ideal strategy is to partition your mortgage in two halves, one linked to a variable rate and the other closed for a longer period of time. The seasoned veteran, possibly with two stable breadwinners in the family and with a substantial amount of built-up equity in the house should still follow Shelly Short’s strategy. They can afford the risk and continue with a variable rate mortgage, making payments based on a high fixed rate schedule. This is an easy way to (think you) have your cake and eat it too. From a purely psychological point of view -- as long as you pick the payment rate to be 1% to 2% above the initial floating rate -- if and when interest rates do start to increase, it should have no noticeable impact on your monthly budget. As far as predictions go for what today's rate hike will have on the local RE market. I expect none. The resiliency of this market is ridiculous. And STUPID. Unfortunately, I think a quarter point hike is not enough to create a quick change. We've already seen a slow down in sales. This may slow them down a bit further, but I don't expect any quick changes downward on the median or average sales prices. There are still a lot of people testing the limits of this market. It's an environment that has rewarded outrageous prices for too long; knocking $80K off a sales price that's $100K over market value is no big deal right? Until people are desperate to sell we won't see significant overall reductions. With all the unsold condos coming online in the fall, maybe we'll see something significant in that market when interest rates hit 5% in October/November? but this one is just too good to let pass by without comment. You can read a more professional take on this poll, over at The Tyee. Need I point out that even they call it a Bubble? Transparency. It's a loaded word. How much of it exists in the land of All Things Real Estate Related? After the DOT COM crash of 2002 and the subsequent ridiculous mess that was WorldCom and Enron, regulators in the US got serious about transparency and shareholder accountability. This is a good thing. Up here in the Great White North, we took things a bit less seriously, but made changes none the less. I might remind you that Canadians were involved at the heart of both Enron and WorldCom collapses; both as shareholders and executives. Our political system up here has resulted in 13 securities regulators all effectively working against each other under the auspicious umbrella of the Ontario Securities and Exchange Commission. This may change with Canada's New Government TM now finally taking a look at it. But what of real estate? Real Estate is another self-regulated industry. Banks have effective control over mortgages and who gets one. But, especially in the past several decades, new lenders have emerged, many targeted towards the much more lucrative developer mortgage lending products. That industry is also self-regulated. What does all this mean? I'm not sure, but I'd wager that things really aren't all that transparent in this country when it comes to real estate buying, selling and investing in real estate-backed securities. So where am I going with all this? Well, if (hypothetically :) ) 1981 happens all over again--you know, people lose their homes because they can't make their payments because interest rates went up--who is going to protect the consumer? Say you follow MSM coverage of the real estate market, you talk to a few Realtors, you check the MLS statistics and go read the CREA website, one could be considered fairly well "educated" about the state of the market, right? But what if those numbers suffer from similar "accounting irregularities" like those found in the files of Enron and WorldCom? What then? We know for fact that Realtors have the ability to manipulate sales information. We know that it happens, but we don't know the true extent of it. Some may argue it's a limited problem, others may argue it is so common that it has become an accepted method of doing business. Either way, manipulation of true statistics is fraudulent. Is reducing our capacity to count stats also a form of reduced transparency? Now before you go getting your knickers in a knot, I am not suggesting that MLS is attempting to cut bloggers out of the picture. But is it not convenient that the new system of listings makes it very difficult, if not impossible, to track numbers that may already be manipulated before they are released? My argument is this: the numbers MLS reports through CREA and local RE Boards are not really complete. They can't be. They ignore new product sales and listings that aren't sold through MLS. Yet because they represent the majority--to what extent we can't be completely sure--of listings and sales in any given RE market, they are the accepted authority in the MSM on the state of the RE markets around the nation. How the heck do we get around this? I'd really like to see some pro-active discussion about how this time the consumer can beat out the market to force a review of the way that our self-regulated RE industry reports its numbers. “Even more importantly, the number of proposals for personal bankruptcies – a possible signal of increased bankruptcies down the road – is now rising by 14.9 per cent on a year-over-year basis – the fastest pace since the 2001 recession,” [CIBC Senior Economist Benjamin Tal] added. That's OK say the bulls. After all it's those Easterners in the manufacturing sector that are suffering, everyone knows that the West is still hot. Except that when Canada's manufacturing sector slows down, so does the need for resource extraction. China's bubble is popping, nickel and copper prices are declining; natural gas has been down for 18 months now. Ignore the warning signs at your own peril. The economy is global. It's slowing down globally. Incomes don't support current debt levels. Hence why the rate of bankruptcies is expected to climb by 15% this year. Banks will get tighter with that debt which means people will get less money and more personal bankruptcies will happen as this generation remembers the lessons they didn't learn in the last credit rate induced crash of 1981. History has a way of repeating itself, non? All the new construction marketing hype has gotten me thinking: "are lifestyle promises a contract?" Can you in fact come back to a developer and claim they didn't deliver what they promised? The other night, we went for dinner to where we thought we were going to receive 5 star food with 5 star service. The place we chose made that claim. They had the 5 star rating on their website and advertising materials. They promised fresh food with ideal wine pairings. Let's just say they didn't deliver. Now I know from having worked in luxury resorts in the past that promises lead to expectations. I know that when expectations aren't met that the customer is usually always right. I knew the other night that had I wanted to complain to a manager that the wait was too long, that the service was terrible, and that we didn't receive any bread with our meal, we could have at least received a discount on our meal if not a re-invitation to try them again on another night of our choosing, on the house. We didn't complain. Instead we left upset that we'd wasted a considerable amount of money on a night that we tend to only permit ourselves once or twice a year. We won't go back and if anyone ever asks we'll tell them never to go there either. So does this rule apply to real estate? If we make a purchase, say at Aquattro or at The Falls or any of the other myriad places that promise a new lifestyle with our luxury condo, what recourse exists for us when our expectations aren't met? Can we demand a discount, or our money back? I know that when I make a deposit I don't pay the remainder until closing. I also know that closing includes my satisfaction that the unit I purchased meets my expectations. I also know I can withhold payment until the work is completed to my satisfaction. Fair enough, we can do this with any property we buy. But we didn't buy at Aquattro for the quality. Sure that was a part of it. But we got taken in by the promise of a stunning view of Mt.Baker over the city skyline. We expect our lives to be enhanced by neighbours without a care in the world. We expect our BMW to be the cheapest car in the secure underground parking lot. And we expect the weather to always be sunny and warm, the breeze to always be fresh and lightly scented with fresh blooming roses and the people who live in our building to be younger looking 50-somethings dressed for a ball or the spa; after all, that's what the marketing promised us. I was at a BBQ last night where we got into the real estate is such a great investment BS, again. I was pained to explain how I believed that to be true if you bought two or three years ago, but if like us, you were caught on the outside looking in, RE ain't such a great investment today. I qualified my argument with equities consistently outperform RE. Did I say consistently? You should have seen the looks on the faces around the table. "You're not telling me that any equity investment you've held has doubled in three years." "Those kinds of stocks are super risky, besides, you'd be looking at only putting really small amounts of money into stocks, it's not like turning $200K into $400K." "Everyone knows RE is the best investment you can make for your family"
Well, apparently everyone forgot to tell Mr. Caspar, a man who actually gets paid to write and seems to me to be somewhat of a misfit in the MSM world: he's balanced in his writing and he doesn't give you a pump job. For that I say thanks, John. And [RE BULL MARKET] been going on for long enough that real estate as an investment has fallen into the "Everybody Knows…" category. You know: "Everybody knows that real estate is a safe investment", or "Everybody knows that real estate outperforms stocks", or "Everybody knows that you can't get hurt in real estate." Like that. And as it turns out, the whole story about real estate as an investment isn't quite the same story that Everybody knows. According to data from the Real Estate Board of Greater Vancouver, in the last thirty years the average price for a detached home had three bear market periods where it took at least two years for prices to recover to their previous high. After prices topped out and corrected in 1981, it took seven years to get back to those 1981 prices. Real estate investors were just getting back to "knowing" how great real estate was when prices peaked and corrected again in early 1990. It was 1992 before prices climbed back to where they were. And then, in early 1995, prices once again started downward. This time, it wasn't until 2003 until the market saw those 1995 prices again. That's right…in very recent history, it took the investment that Everybody believes in eight years to recover from a downturn. So there it is. Three bears for real estate, with durations of 7, 2 and 8 years. Four bears for Canadian stocks, with durations of 2, 2, 2 and 5 years. So what were the comparative returns for those two asset classes over those 30 years? Well, based on the data mentioned above, the average detached home in Greater Vancouver went from $80,000 in 1977 to $785,234 in (April) 2007. Wow. Can you believe the average Greater Vancouver home once cost 80 grand? And can you believe it's now nearly 10 times that?! That's a total return of about 882 percent, or an average annual return of nearly 8 percent. Nice! if you had invested $80,000 in the index in 1977, it would be worth over $2.5 million in April 2007. That's more than 3,000 percent return, or an average of over 12 percent per year. Very handsome. And by the way, if you'd invested the same amount in the U.S. S&P 500 index, you'd have over $3.1 million in Canadian dollars today – a 3,825 percent return, or an average of 13 percent a year. So, as it turns out, over the long run stocks do rather well compared to real estate. Of course, on an intuitive basis, you'd figure this out anyway, right? Because if Everybody knew they could make more money in the long run by simply owning real estate rather than owning resources companies and financial institutions and industrial firms and telecom companies, they'd never start, run or buy a company. And Everybody knows that's just silly. What John doesn't point out directly in his article (he uses a period from 1977-2007 or 30 years for his comparison) is that in those thirty years, 11 years were bearish in equities while 17 years were bearish in real estate. In terms of percentages: 37% of the time you looked at your stock portfolio you were losing money during those 30 years while 57% of the time you received your BC Assessment notice your "fail-safe" RE "investment" was worth less than the previous year. First off, my apologies for the lack of writing this week. I had two finals on Friday and have been feeling genuinely uninspired and wanted to save you from some of the potential drivel that could have been published here, so I stayed away. Slight decreases in inventory during the last two weeks of June. It will be interesting to see the June numbers out of VREB, I'm guessing based on these observations and the notes over at Victoria's Truth, that the bear points scored in May was a short-lived rally. The increases in interest rates have not provided a loud enough scare yet apparently; although even our agent concedes the market has changed. I'm not expecting increases in sales prices, just overall sales. I'm guessing that the market has flattened considerably in terms of price. Can't tell you the last time we saw something sell for over list in our segment. Hope everyone has a great holiday weekend. If you're stuck at work like I am today, spend it pondering this question: are we more like our cousins to the south out here in the west, our like our brothers and sisters east of the lakes? Canada Day, eh?